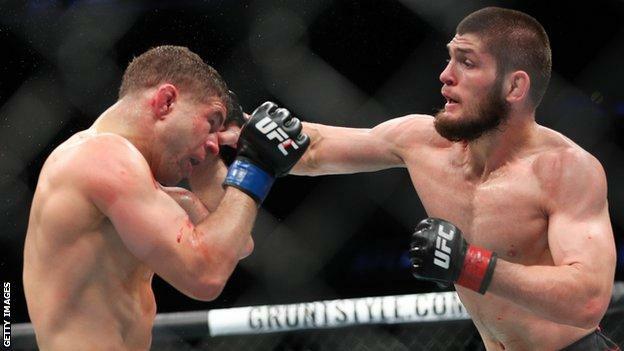 Al Iaquinta says Conor McGregor will have to fight him before a possible rematch with Khabib Nurmagomedov. Ireland's McGregor tapped out in the fourth round in October as Nurmagomedov retained his lightweight title. Iaquinta beat fellow American Kevin Lee on points after five rounds in their rematch at a UFC event on Sunday. "If Conor thinks he's getting a rematch [with Nurmagomedov] before me I think that is nonsense," said Iaquinta, who lost to the Russian in April. "I'm the guy he has to get through if he wants to get a rematch. "No immediate rematch for him, he tapped out." McGregor fought Nurmagomedov at UFC 229 in Las Vegas when he made his return to the octagon after a 693-day absence. In the aftermath of his defeat, he said: "If it is not the rematch right away, no problem. I will face the next in line."